Hey there. I week or so ago, Southern California was under a killer heat wave. Temperatures reached into the high 90s and topped 100 degrees in some areas. Well, that heat took our rabbit with it. We've had "Fluffly" for close to a year and we were not really educated in rabbit care during high temperatures. We left Fluffly outside and I covered his cage with some brush and grass to create a roof and when we got home that evening, he was no longer hopping. I did a quick makeshift burial for him and the kids were crying. The youngest one was still wondering why we didn't take Fluffly to the hospital, since there was no blood. lol She didn't understand. My wife and I were devastated and upset. We wondered if we should get another rabbit. We read up on how to take care of it during high heat and we found out that it's a tough job. You need to make sure it's cool. Rabbits do not handle heat very well. Well, after some consideration, we decided to get another rabbit. We picked it up on Friday and we must say, we're a little surprised by it. 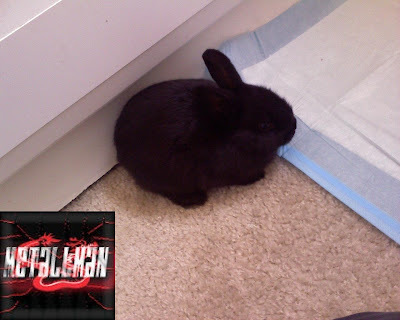 First, it's a black rabbit, so Shadow is a perfect name for it. I was naming it "Grass Guzzler" and "Pellet Chomper" to see if any of those names would please the kids. lol They laughed them off, of course, and then my wife suggested Shadow and everyone was in agreement. Shadow is getting used to it's new home. Jack, our cat, seems to be afraid of him so there's no in house animal fighting. 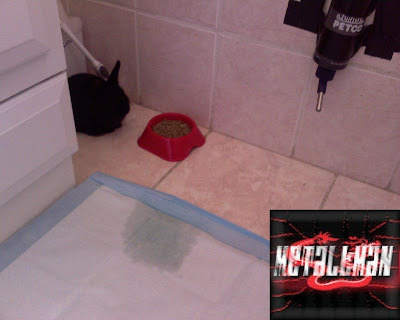 lol Another thing that's tripping us out is that Shadow seems to be potty trained. Weird, no? We keep him in the bathroom during the night and he used the dog mat that I left out for him and it did it's business on the mat. We were like, "whoa..." I've never seen a rabbit do that. They're known for crapping all over the place and we're fortunate and Shadow is not like that. So far, he's only done his business in the bathroom. If Shadow keeps it up, he may be a in house bunny. So far so good. I just need to make it more of a home for Shadow instead of just taping the water bottle to the wall. lol You gotta give me points for creativity. lol Until then, later! So sorry about fluffy. And you new rabbit is super cute! I'm glad that I found your blog.